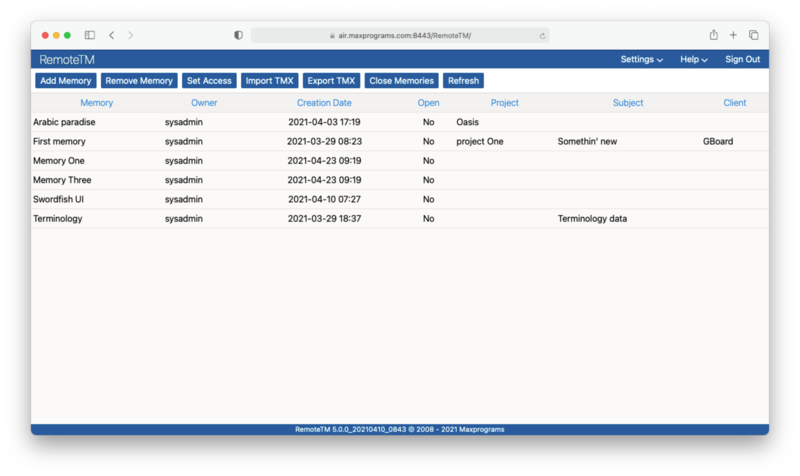 RemoteTM WebServer is a Translation Memory server designed for sharing the super fast Internal database engine included in Swordfish III in network environments. With RemoteTM you can share your data on the Internet (WAN) and also in a Local Area Network (LAN). RemoteTM Web Server is a multiuser web application that runs on top of Apache Tomcat or Eclipse Jetty, two open source implementations of the Java Servlet and Java Server Pages technologies. Data is transferred between Swordfish III and RemoteTM Web Server using XML-RPC technology, a standard mechanism that uses HTML as transport layer and XML as data encoding method. RemoteTM Web Server is faster than all SQL-based database engines that can be used with Swordfish III in a LAN or over the Internet. Runs on Windows, Linux and macOS. RemoteTM web server is available for purchase or for rent as a service in our online store. Java 1.8 (OpenJDK is available at https://adoptopenjdk.net). Apache Tomcat 8 (available from http://tomcat.apache.org) or Jetty 9 (available from http://www.eclipse.org/jetty/). Click the Download button below to download a platform independent WAR file. Installation instructions are available in the User Guide. You can evaluate RemoteTM for 30 days in your own server or send an email to tech@maxprograms.com and request a free account in one of the test servers that we host. Get RemoteTM_backup.zip, a zip file containing scripts to backup RemoteTM databases on Windows, Linux and macOS.